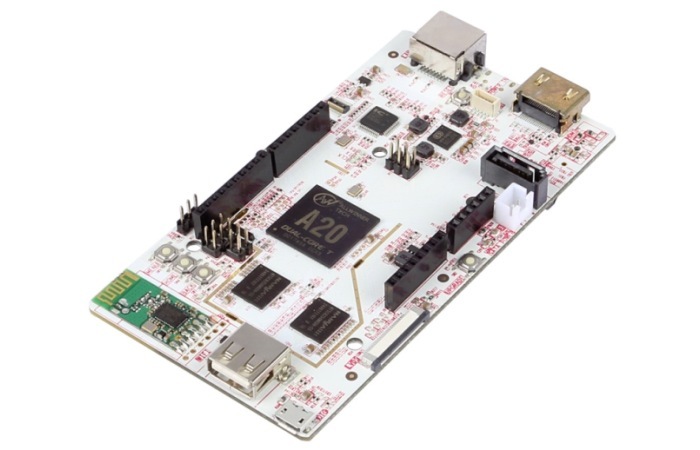 A new development board has been unveiled this week called the pcDuino3 that Is now available to purchase $77 and is powered by a 1GHz Allwinner A20 ARM Cortex-A7 dual-core processor supported by ARM Mali 400 dual-core graphics and supported by 1GB of RAM of RAM. The beauty of the pcDuino3 is that it supports both Android and Ubuntu operating systems as do many other boards, but the pcDuino3 also supports the Arduino platform allowing you to easily add Arduino shields for further development and expansion. Other features of the new pcDuino3 development board include 4GB of flash storage with a MicroSD card slot for up to 32GB of additional storage when required. Ports included on the board are a HDMI 1.4, 1 x USB host port, 1 x USB OTG port, Ethernet, 3.5mm audio and it comes fitted with a IR receiver. The pcDuino3 is capable of running Android 4.2 and Ubuntu 12.04.